Avid fans of hollandaise sauce and McDonald's might want to travel to Taiwan where the chain recently introduced new Eggs Benedict as part of a limited-time Big Breakfast platter. 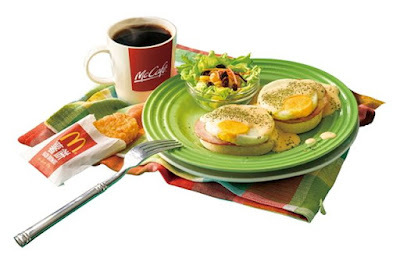 McDonald's version of Eggs Benedict is basically an open-faced Egg McMuffin topped with hollandaise sauce. It's featured in the Double Eggs Benedict Big Breakfast, which as the name implies. means you get two of them. Each features one half of an English muffin topped with Canadian bacon, a cooked egg, and hollandaise sauce. The platter also comes with a seasonal salad as well as a combo option to add hash browns and a hot or cold drink. The platter goes for $99 NT (~$3.02), while the combo is $129 NT (~$3.93). The Double Eggs Benedict Big Breakfast platter is available through September 13, 2016, while supplies last. This is not the first appearance of hollandaise sauce on the McDonald's menu. 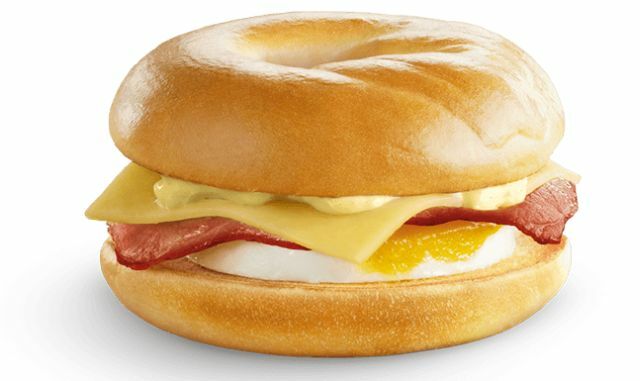 It enjoys a more permanent menu status in New Zealand as part of the NYC Benedict Bagel (shown above), which includes back bacon, egg, cheese, and hollandaise sauce on a toasted bagel. First Photo via McDonald's Taiwan. Second Photo via McDonald's New Zealand.